We had been looking forward to this race all year. In fact, you could say we built the #38 car for this race. 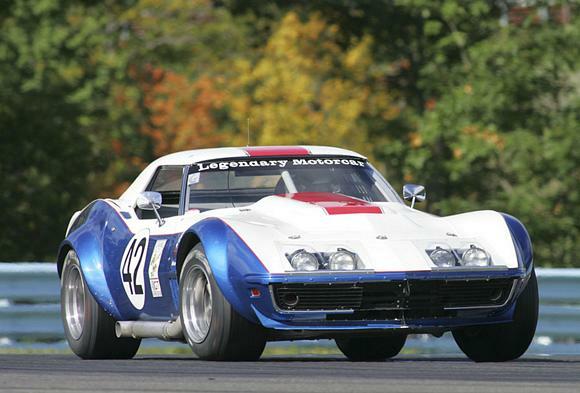 In 2005 Peter Klutt built his now famous 69 Corvette and made a one hour TV show out of the build and the first race. Peter had the Dream Car Garage program that was then on Speedvision. 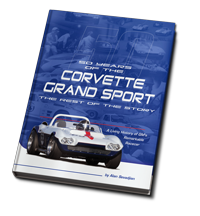 The car was built to a new and at that point unprecedented interpretation of the SVRA rule book. It was way fast right out of the box and has not been beaten since. You are going to need one of our cars to beat this car! 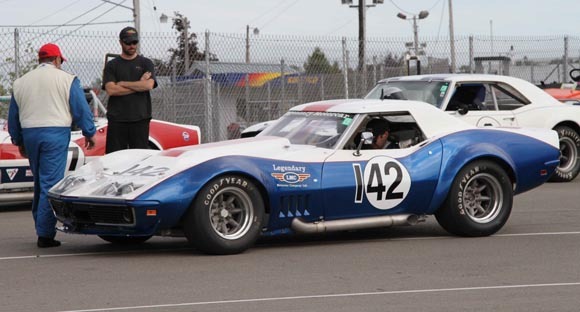 At the time there were a lot of Corvettes running in SVRA Group 6. After Klutt blew everybody’s doors off, not all that many came back! It became pretty apparent that you couldn’t just dust off some old used-to-be racecar and expect to win in SVRA Group 6. At the time we were running our Grand Sports in SVRA Group 5. We decided to build a Group 6 car like Klutt’s to beat him at his own game. Klutt had made the US Vintage Grand Prix every year since 2005, so we planned on meeting him there this year. 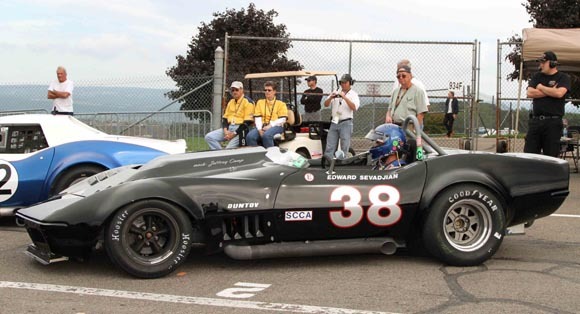 The June SVRA Watkins Glen race was supposed to be our tune up, but that race was all but a total rain out. Edward got less than 20 laps on the track in June, but we figured we would be OK. He is a fast learner. Klutt spent really big bucks on engine development, and we are way behind him in that department, so for our car to beat his, we would have to out handle his car. So the stage was set. We brought Clair’s 68 and our 69 for what we hoped would be the long awaited showdown in SVRA Group 6. In the first qualifying session, Edward was first in line and therefore got a clear lap. He only ran two laps and qualified on the pole with a 2:03. Klutt was bedding brakes and only ran a 2:12. Edward is giving Klutt’s car a hard look prior to the start of the last qualifying session. We chose not to run the second qualifying session, knowing Klutt would be either on the pole or outside front row, and it didn’t matter because in either case we would both be on the front row. Klutt ran a 2:02 and got the pole. Clair ran a 2:08.9 and qualified 8th. This is the as close as we got to Klutt – the false grid for the first race. On the out lap of the first ‘Qualifying Race’, we broke a valve spring! 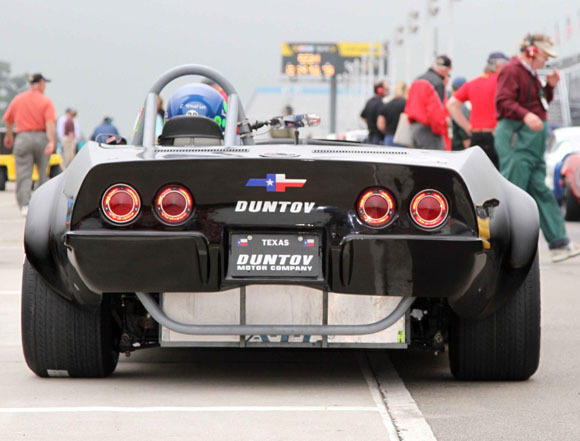 This followed a complete engine overhaul after Road America. What a black day! Klutt only went as fast as he had to and won the race with a fast lap of 2:05. Clair finished 9th. In Clair’s 90 minute enduro, the plan was for Clair to start, Edward to do the middle stint and Alan to finish. 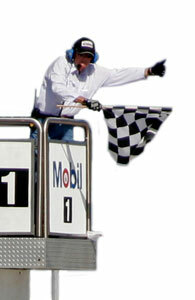 If the ‘A’ team was needed at the end of the race, Edward could stay in the car. With the exception of one practice session, Alan hadn’t driven at Watkins Glen since 2005, so he was only going to drive the car if the race was already won (or lost!). Clair helping Edward buckle in for the second stint. The endurance race included all the fast SVRA classes, so the production based Group 6 cars were mid-pack at best. Clair started 21st and ran 17 laps, bringing in the car in 9th place. Edward rejoined in 20th position and worked his way back to 9th prior to the next pit stop. He was running 2:05’s and was only a few car lengths behind the Group 6 leader when he pulled in. We didn’t add any fuel on this stop, as we figured we should have enough to finish. Needless to say, Edward stayed in the car and rejoined only to run out of gas a few laps from the end! We made a really big error by calculating fuel consumption on Clair’s 427 using fuel consumption figures we had calculated from the now dead #38 black car. We thought Clair’s car would use less gas than the black car, but it actually used much more. It was another painful lesson. We finished 27th overall, twenty spots back from where we should have finished had we stopped only twice. In Sunday’s race, again Klutt played with the field, running one lap at 2:03.9 and winning the race by less than a second over Mike Donohue, whose best lap was only a 2:05. All weekend only Edward and Klutt ran faster than 2:05. Clair finished 7th with a fast lap of 2:08.2, which was 7 tenths better than his qualifying time.